Also called Sweet Violet, this small perennial plant is readily recognized by its heart-shaped leaves and sweetly-scented lilac-colored flowers that appear in early spring. What many people don’t realize is that the violet actually blooms again in the fall, only the flowers are inconspicuous and laden with seed. This makes the violet self-fertilizing, or in botanical terms cleistogamous. Dried violet flowers and leaves are made into syrups, tonics and teas. The herb is also used to make poultices, and is tinctured for use in topical ointments and salves. Blue violet is a hardy, herbaceous flowering perennial of the Violaceae family. The familiar leaves are heart-shaped, slightly downy, especially beneath, on stalks rising alternately from a creeping rhizome or underground stem, the blades of the young leaves rolled up from each side into the middle on the face of the leaf into two tight coils. The flower-stalks arise from the axils of the leaves and bear single flowers, with a pair of scaly bracts placed a little above the middle of the stalk. The flowers are generally deep purple, but lilac, pale rose-colored or white variations are also frequent, and all these tints may sometimes be discovered in different plants growing on the same bank. 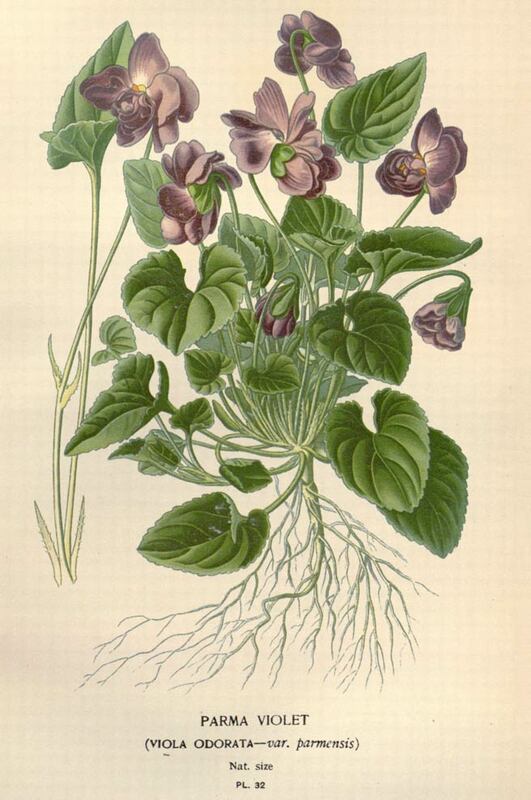 The sweet-scented violet appears at the end of February and has finished blooming by the end of April. 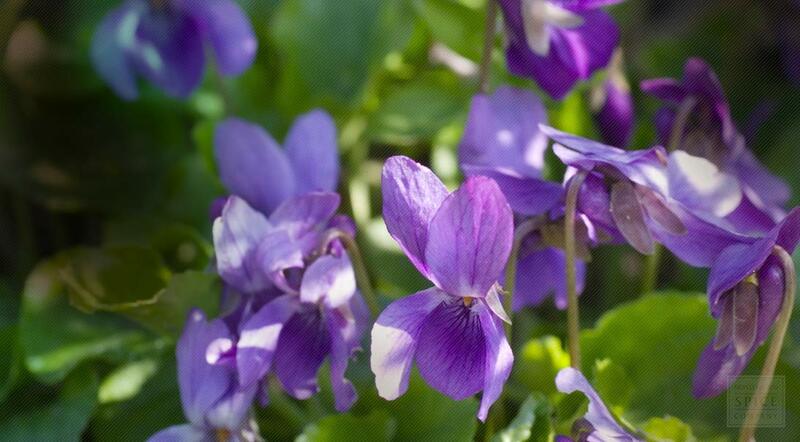 Viola refers to the violet color of the flowers and odorata refers to the sweet scent of the flowers. Viola odorata is native to Europe and Northern Asia. Along with many regions in North America, Viola odorata can also be found in most of Europe, northwards to the British Isles, Southern Scandinavia, Lithuania, Central Russia, North Africa, the Mediterranean region and West Asia. Blue violet is most often found in open deciduous woods, pastures, moist meadows and swamps. Blue violet prefers a rich, moist, sandy soil with a sheltered position. Blue violets grow readily from underground runners, or you can grow from seed. To grow from seed—place a bag over the seed heads to capture ripening seed and allow pods to dry on the plant; break open pods to collect seeds. Sow seeds directly into garden soil outdoors in fall or in the winter sow in vented containers, cold frame or unheated greenhouse. Be sure to stratify the seed if sowing indoors. Harvest Blue violet leaves and flowers as they come into bloom in Spring. If the plant has underground runners spreading, then you may harvest the entire plant, just cut the runners at the base and leave them below the soil to grow into new plants. Dry the flowers and leaves by lying them flat on screens in a dry place, or if harvesting the entire plant, hang the plant upside-down to dry in a cool, dry area. Store dried parts, whole or cut into pieces, in an airtight container. Blue violet (Viola odorata), also known as sweet violet and English violet, is a highly aromatic herb used in beverage, cosmetic and perfume industries.